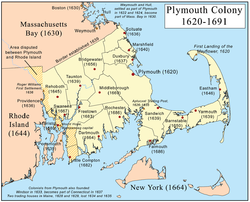 The New Plymouth Colony was established with the landing of the Mayflower in 1620. It became part of the Dominion of New England from 1686 till 1689, and then later merged with the Massachusetts Bay Colony to form an entity called Massachusetts in this file. See http://en.wikipedia.org/wiki/Plymouth_Colony for more information.